Deputy Director of Humanities at IE Humanities Center. B.A. in Humanities and M.A. in Cultural Heritage Management from Universidad San Pablo-CEU (SPAIN). . Master in International Management from IE Business School (ES). 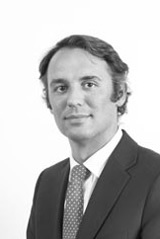 Fernando was born in Palma de Mallorca and raised in UK. Prior to joining IE, he developed a professional career in the Art Industry, in firms such as the cultural institution CaixaForum, the Italian art publisher Franco Maria Ricci or the auction house Sotheby’s. He joined IE Humanities Center in September 2010 and as Deputy Director of Humanities has several responsibilities. Coordinator of the different Humanities courses delivered by the Humanities Center to all graduate and postgraduate programs of IE Business School and IE University. He is also responsible of the Center’s communications channels – Humanities Blog and Liberal Arts Newsletter- as well as head of IE’s cultural events. This includes conferences, speaker seminars, visits to museum, etc. His main interests are Fine Arts, Hispanic History, History of the Mediterranean Region, Travel Literature, Photography and Religious Studies.